Amazing things keep happening with the Amazing Ruzu bitters. Ruzu is getting to the point where it markets itself, I mean testimonies continue to abound with this amazing products. All the sales made today were made from testimonies of people who have used it or people who have heard what it does and happened to be present where I gave a marketing pitch about it. A big man in suit asked a market woman for pen to take down my numbers- that happens when you run out of flyers, well, I still had a last complimentary card to give my new friend,(My hobby is making new friends and adding value to them). 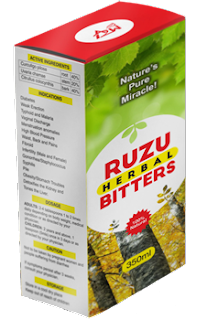 So what is Ruzu? You ask. produce breath-taking results!" This product is not just another supplement, it is curative and the effects can be seen in under 24 hours. It's Natures Pure Miracle!"